friday night’s amazing race | is there any more pie? Posted on September 25, 2015	by is there any more pie? Today we were determined to get into our motel room tonight in time to see the opening episode of this year’s new season of “The Amazing Race”. We got a late start. But we still managed to drive 515 miles and arrive with three minutes to spare, or so we thought. It turned out that TAR wasn’t on until 8 PM, not 7 PM. We had time to unload cheese and crackers, nuts, avocados and oranges from the car. Banjo Man has quite a hoard of snacks. We will never starve on the road. We could live for weeks off his supply of almonds and peanuts. It’s like traveling with a squirrel. I have learned all about “apps” on my I phone. I have a Hilton Honors app that lets me make hotel reservations and even check in. Tonight, as we raced into the hotel, the woman at the reception desk simply handed me the key cards with our room number on the envelope. I had used the app to check in via the phone. I also have a TripAdvisor app that lets me search for hotels in various locations. And a History app from A&E that shows me where historic sites and markers are as it tracks my location across the country. Do you have any suggestions for more travel apps? Here are some pictures from the HyVee grocery store last night. 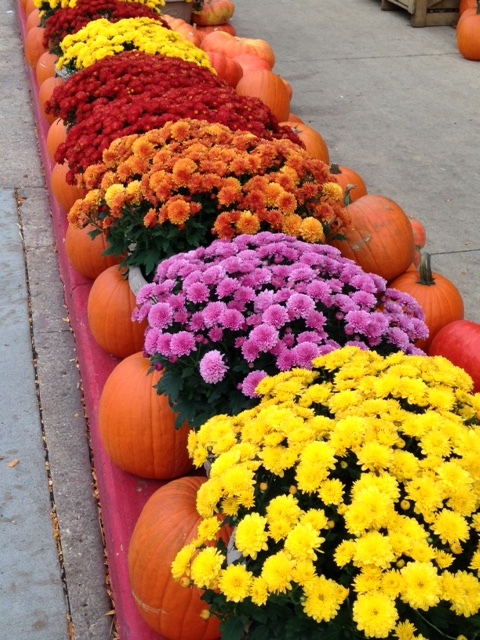 The flower and pumpkin display make me want to buy all of them and decorate my yard. 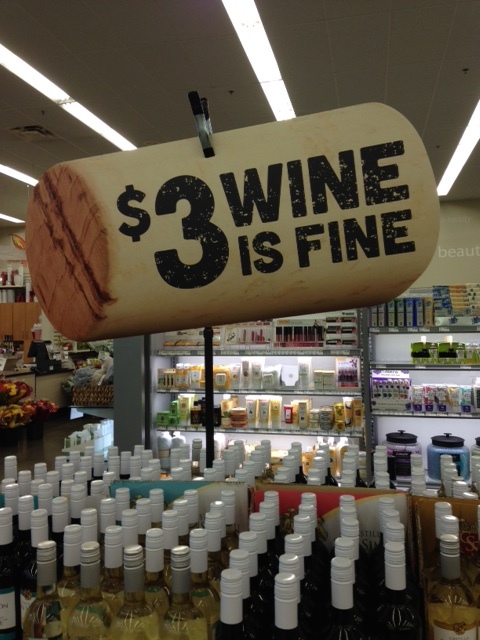 If $2 Chuck wins awards, does that mean $3 wine is VERY fine! I have missed the mums! I’m going to buy some big ones when I get home. You need to get some, Sharon!